Instruments for Life Sciences Research! The HPE™ BlueHorizon™ is a flatbed system for horizontal electrophoresis using precast gels, self-cast gels and gel strips. Main applications are isoelectric focusing (IEF) including the run of IPG strips (like SERVA IPG BlueStrips) in 2D PAGE and SDS PAGE, but also the separation of nucleic acids in polyacrylamide gels. The HPE™ Tower System allows electrophoretical separations in up to four horizontal gels at the same time. It is used for 1D and 2D electrophoresis gels, where multiple runs are an important demand. 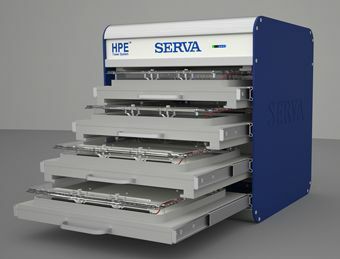 Structurally, the HPE™ Tower consists of four horizontal electrophoresis chambers, which are built as movable drawers into a metal housing. The HPE™ Tower and the HPE™ gels have been developed together as a system, in order to achieve better results than can be obtained with conventional SDS polyacrylamide gel electrophoresis (PAGE) technology. The precast HPE™ gels, which are less than 1 mm thin and film-backed, are protected from light during the run. No glass plates are used. They are placed on aluminum oxide ceramic cooling plates, which ensures very efficient heat dissipation and therefore straight electrophoretic migration in each gel. HPE™ Tower (HPE-T02), HPE™ Power Supply Package (HPE-PSP) and HPE™ Cooling Unit (HPE-CU1). The semi-manual SERVA HPE™ ScreenPicker alllows spot picking from fluorescent gels without visual post staining. The gel is placed on a horizontal flat screen which displays the scanned 2D image 1:1. Spots to pick are visualized one at a time by crosshair on the image. The plugs are disposed error-free into 96 well plates by using the picking list and the intgrated plate identifier control. Gel format 7 x 10 cm for quick analysis of up to 28 samples. Contains main unit and also: 1 removable UV transparent gel tray (7 x 10 cm), 2 gel casting gates, 1 comb (1.0 mm, 8 samples). Gel formats 15 x 15 cm or 15 x 20 cm for best resolution or high throughput analysis. Contains main unit and also: 1 removable UV transparent gel tray (15 x 20 cm), 1 removable UV transparent gel tray (15 x 15 cm), 2 gel casting gates, 2 combs (1.0 mm, 16 samples). 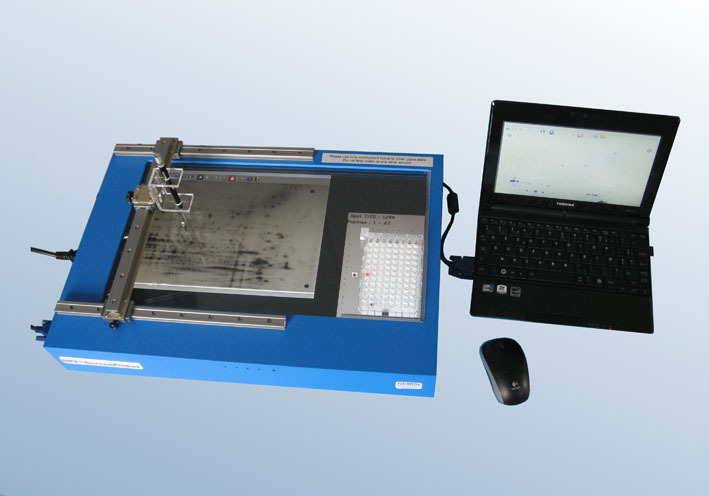 The allround instrument serving many applications, e.g., SDS PAGE, submarine electrophoresis and blotting. 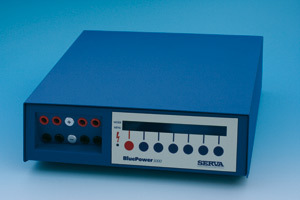 BluePower™ 500x4 features 500 V, 1000 mA and 200 W. The BP-500x4 power supply is particularly advised for operation of up to four vertical slab gel units run at higher voltage, also resulting in shorter running times and for blotting applications (tank blot, semi-dry blot). 4 x 2 outlets, programmable. BluePower™ 3000x4 is designed for high voltage applications (isoelectric focusing, DNA sequencing) delivering 3000 V, 200 mA and 300 W. Other applications (SDS PAGE, submarine electrophoresis) can be performed as well. 4 x 2 outlets, programmable. BlueVertical™ PRiME™ has been especially designed to run SERVAGel™ precast gels and other precast gels with an outer cassette dimension of 10 x 10 x 0.7 cm. The fixture of the inner core unit has been completely re-engineered to ensure the precise fit of the gel cassette(s). The BlueVertical™ is the perfect electrophoresis mini tank system to run precast gels in SDS PAGE, native PAGE, IEF or nucleic acid PAGE applications. A unique innovative clamp system keeps the gel cassettes in their correct place at the inner core running module, leak-free and ready to start within seconds. Built-in convenient operation features result in improved daily work. Developed, produced and assembled in Germany – another top quality product from SERVA. Temperature control on your bench! The SERVA BlueThermo H and HC shakers are precise heating (H) and heating & cooling (HC) thermoshakers. 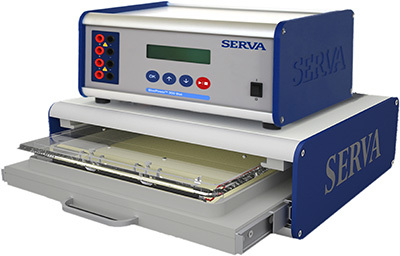 The SERVA BlueShake 3D works with a rotational 3D motion and is flexible applicable in various incubation and preparation techniques (e. g. staining/destaining procedures). 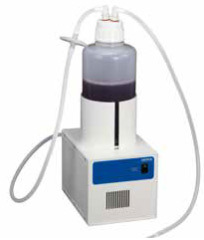 Automatic cell culture aspiration system with autoclavable 4 l - bottle. With the handle, the aspiration speed and suction start / stop is regulated. Extendable for up to four users by connecting more bottles and handles. Space saving setting with bottle on top. The membrane vacuum pump is mounted in a metal-solid body. The pump is noise reduced, produces a vacuum down to 100 mbar and aspiration speed of 17 l / min. The 4 l polypropylene bottle with fast-lock clutches ensures an easy removal for cleaning. The safety ﬁlter prevents leaking of liquids.